Welcome to the VIU Canada Goose Project! Canada Geese can be seen regularly around Nanaimo, but this wasn’t always the case. Their numbers on Vancouver Island soared as a result of pre-1990’s introduction programs. In many areas, these introduced geese are conflicting with agriculture, fouling sports fields, and causing damage to fragile local estuarine ecosystems. How many geese are there? Is the population still growing? Where do they like to hang out? Do they fly to other locations on Vancouver Island? How long do they live? Do hunters have any impact on the population? To help answer these questions, Vancouver Island University (VIU) in partnership with the City and Nanaimo has set up the VIU Canada Goose Project to assess the abundance, distribution, and movement of Canada geese in the Nanaimo area. Four-hundred Canada geese in Nanaimo were fitted with white collars and metal leg bands over two years (200 in 2016 and 200 in 2017). Each collar features a three-digit code in black lettering followed by the letter “P”, which is unique to each goose. Sightings of these collared geese are an integral part of gathering the data necessary to accurately assess the abundance, distribution, and movement of geese in the Nanaimo area. 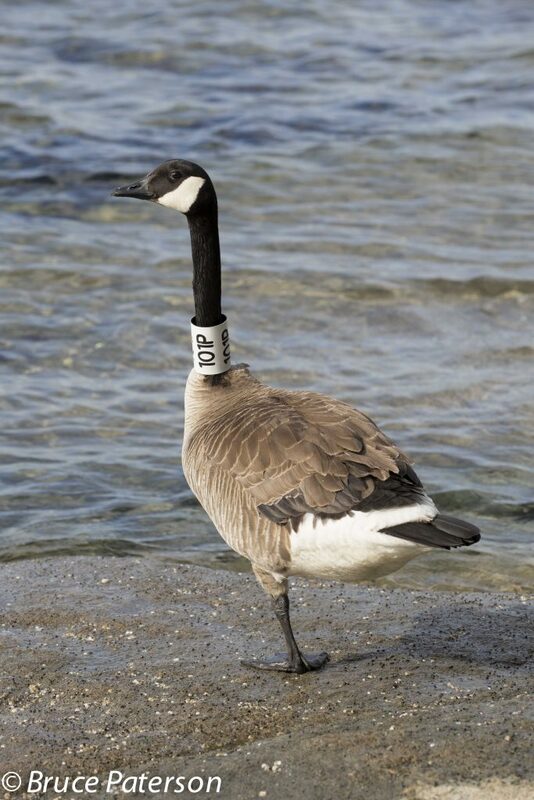 If you see geese with collars around Nanaimo, please report them using our Canada Goose form. Geese from other studies may also be observed in the area; if you see a collar with a letter other than “P”, it should be reported to the North American Bird Banding Laboratory.